Greg (Jason Drucker) feels that as a kid, he has no control over his own life. When his mother announces that the Heffley family is going on a road trip to attend their grandmother's birthday party, Greg's older brother Rodrick (Charlie Wright) is horrified. Greg isn't phased because he discovers that a video game convention is in Indianapolis the very weekend of the road trip and he thinks he'll be able to sneak away to attend it. Unfortunately, it turns out to be a lot farther away than he expected. Along the way, they run into another family that causes trouble for the Heffleys and Greg's younger brother Manny wins a piglet when the family stops to visit a country fair. 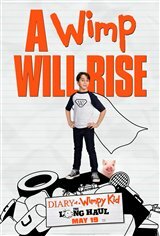 Based on the ninth book in The Diary of a Wimpy Kid series by Jeff Kinney.